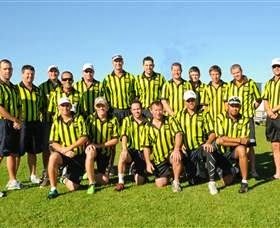 The Queensland Oztag Senior State Cup is the pinnacle of representative Oztag in Queensland. The competition hosts the best players from around the state selected to represent their venue and compete for the title of state champions. The Senior State Cup consists of fourteen divisions: Men's U16's, U17's, opens, 30's, 35's, 40's, 45's, and 50's divisions, Women's U16's, U17's, opens and senior divisions and Mixed open and senior divisions. The 2013 State Cup was also held in Caloundra and was a huge success with 61 teams in attendance, with 2014 team numbers expected to be 80 participants and families.